Starting with, what the hell is it, anyway? 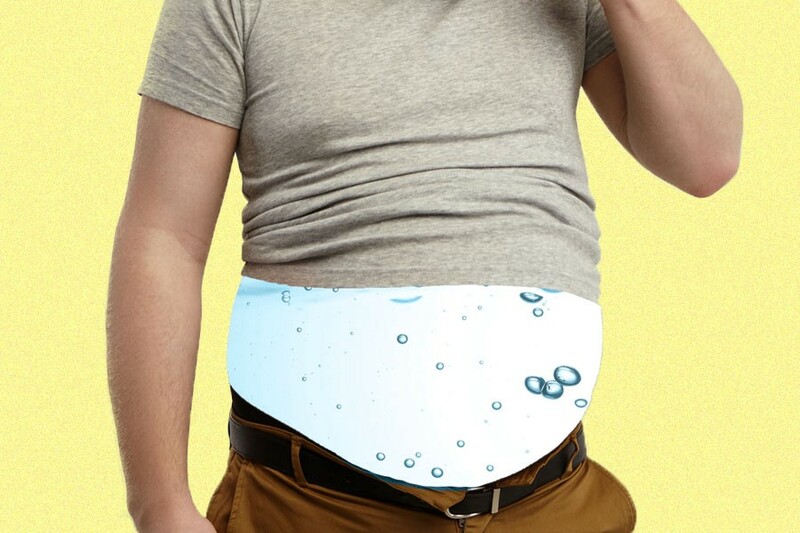 “Water weight is simply excess water stored in our cells and in the area surrounding our cells,” says nutritionist and personal trainer Sean Salazar of Anywhere Gym. When we’re retaining water, that excess water will exist primarily in the tissue surrounding the cells. “Our cells will swell a bit, too, but this takes time and cell size won’t change a whole lot,” says Salazar, hence the water being stored between them. This is why someone with a lot of water weight might see, say, their ankles swell up. The most common cause of gaining water weight is stuffing yourself with too many carbohydrates. Salazar explains that when we consume carbs, they’re converted to energy (specifically, glucose) but when we consume too many carbs, it gets stored as fat. It’s the process of converting those carbs into fat that makes you retain water: According to Paleo Leap, consuming one gram of carbs requires three to four grams of water to process and store it. So when we’re eating more carbs than we can use, our bodies are going to retain water simply to store that fat. Do we need that water weight? Why do you lose water weight before regular weight (i.e., fat)? When you’re sitting in a hot sauna, you may sweat off two pounds of pure water weight without moving a muscle. That’s because it doesn’t require you to burn the weight off like fat — it’s just water, so it’ll easily exit though your pores just by sweating it out. The same happens while you’re sweating during a workout. How do you know if you’re losing water weight or actual weight? It’s tough to determine just how much fat you’re losing versus water weight. Salazar says that if you’re losing more than a couple of pounds per week, unfortunately, most of that is going to be water weight — realistically, your body isn’t going to lose that much weight that quickly. There are more extreme cases, of course: If you watch The Biggest Loser and see someone drop 12 pounds in a week, they’re going to be losing water weight, fat and possibly even muscle due to the fact that their extreme calorie reduction may lack sufficient protein. These big drops in weight are achieved by being able to work out for hours and hours a day, basically the equivalent of a full-time job. “That’s why so many of those people gain the weight back after the show is over,” Salazar says. Losing more is possible — especially if you’re trying to lose a lot of weight — but if you’re a fairly average size and seeing big drops in those first few weeks, or if you’re having weight fluctuations instead of steady drops, it’s probably mostly water weight that you’re losing. Does water weight “count” when you’re trying to lose weight? Salazar believes so. “If your diet is a temporary change, or an inconsistent one, then you’re going to see the water weight go right back on.” But, he continues, if you see yourself steadily lose weight after those initial few weeks, then you should feel free to count that water weight as gone. Think of it like this: If you’re truly changing how you eat on a permanent basis by reducing your carb intake, you’re reconstituting your body’s makeup so it’s now adapted to consuming less carbohydrates. With that new lifestyle, your body will no longer retain such heavy amounts of water, so you won’t have so much of that water weight floating around inside you anymore. Wasn’t that fun? Now, the next time someone undercuts your weight-loss victory, you can dazzle them with your vast knowledge of the subject. Or at the very least, you can understand why your all-calzone diet makes you feel as bloated as hot-air balloon.